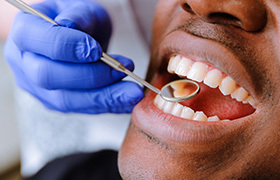 Absolutely everyone deserves to have a smile they’re proud to show off, but many people feel held back by noticeable stains, chips, cracks, and gaps in their teeth. Fortunately, Dr. Cowell knows exactly how to give their smiles the boost they need using cosmetic dentistry. Our team can work with you to design your dream smile and then make it a reality all over the course of a few simple appointments. Whether you’re looking for a minor touch-up or a dramatic makeover, we can make it happen, and we know you’ll absolutely love the results. To get started, contact us today. Has a love of coffee, wine, tea, or simple aging or unlucky genetics left your teeth looking a bit stained and discolored lately? 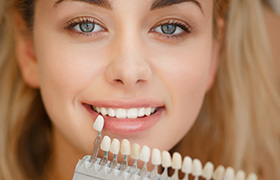 We can easily turn up the brightness of your smile with our professional whitening treatments. With in-office Zoom! 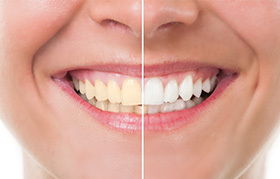 or Ultradent, we can make your smile up to EIGHT shades whiter in as little as an hour. Or, we can give you your own custom-made kit so you can effectively whiten while you just sit and relax at home. These extremely thin porcelain coverings fit directly onto the front of the teeth and resemble real enamel in every way. They are always custom-made according to a patient’s specifications, and you can get one for a single tooth or an entire set to achieve a brand new smile. Whenever we repair a tooth that shows when a patient smiles, we don’t just want to restore its strength, but its beauty as well, and that’s why we only use metal-free restorations. These crowns, bridges, inlays, and onlays are made of 100% zirconia, a high-quality ceramic. With it, we can create a restoration so lifelike that even our patients have trouble telling them apart from natural teeth! In the end, these make it seem like nothing was ever wrong with your smile. Want to get rid of that one pesky stain, chip, or gap that has bothered you for years? With direct bonding, Dr. Cowell can make it disappear in just about an hour. He’ll start by applying a color-matched composite resin to build up any damaged/missing enamel, and then he’ll literally sculpt it into the perfect shape and size. After hardening it with a curing light, you’re done! It’s just that simple. This treatment is fast, painless, and the results can be trusted to last for 10 years or more.